Electric power and innovation come together to create the 2019 BMW i8 for a thrilling ride. This stylish and sporty model is exciting to drive and captivating to watch. Discover the appeal when you test drive a 2019 BMW i8 near La Jolla, CA at BMW of El Cajon. Come into the dealership if you live near Kearny Mesa, near Mission Valley or near San Diego, CA to see the latest deals on the 2019 BMW i8 for sale in El Cajon, CA. Pick out your next model from the 2019 BMW i8 inventory near La Jolla, CA today. Design isn’t just about looking good for the 2019 BMW i8 though it does it well. The focus for every aspect of this roadster is on how it performs with carbon fiber reinforced plastic for a lightweight feel as you drive with more responsive acceleration and stable handling. Inside the cabin is sophistication which is also sustainable with open-pore eucalyptus wood and fine leather upholstery with olive leaf extract, which is a natural tanning process to prevent fading. Sharp angles, a sloping roofline and low profile enhance the race car image. A long wheelbase gives the feeling of speed even when the car is sitting still. Heated front seats wrap you in comfort while BMW Navigation helps you find your way. Thanks to a TwinPower Turbo engine, you can experience raw power in the 2019 BMW i8. This three-cylinder engine provides up to 228 horsepower with 236 lb.-ft. of torque along with an eDrive electric motor for a total power of 369 horsepower. Driving dynamics control fits the way you drive with multiple modes, including eDrive, ECO PRO, COMFORT and SPORT. With the option of using a standard wall outlet or a special wall charger, your vehicle is ready to go in no time. Feel safe behind the wheel with advanced safety features, such as Active Driving Assistant with Surround View. This system includes frontal collision warning and pedestrian protection. 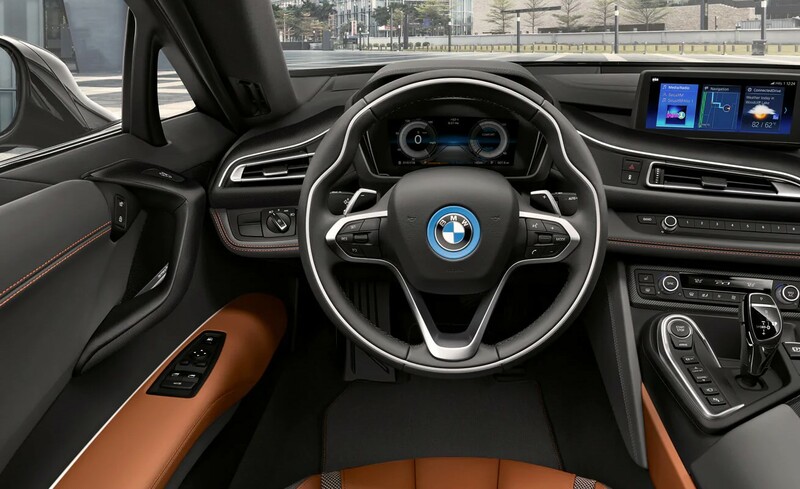 Discover more about the 2019 BMW i8 in El Cajon, CA when you come in to BMW of El Cajon to see this model in person. Choose either the coupe or roadster for an exciting ride every time.